COLUMBUS, Ohio (AP) — Maybe both teams already were looking ahead to The Game. Whatever it was, Michigan and Ohio State struggled with middling Big Ten teams Saturday. Instead of easy tuneups, the games against 5-5 teams nearly became nightmare traps. Ohio State played horrendous defense and escaped with a 52-51 overtime win only because Maryland quarterback Tyrrelle Pigrome misfired on a 2-point conversion try. 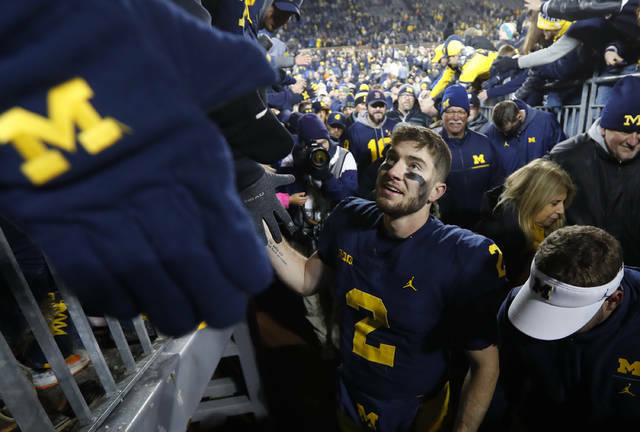 Michigan, holding onto one of the coveted top 4 spots in the College Football Playoff ranking, trailed Indiana 17-15 at halftime before escaping with a 31-20 victory. But both prevailed, preserving the enormity of the annual heavyweight fight. The Big Ten East and a chance to play Northwestern for the conference championship hangs in the balance. If No. 4 Michigan wins out, it almost certainly will secure a spot in the playoff. The No. 10 Buckeyes likely would be satisfied with a conference championship in this season of injuries, inconsistent play and off-the-field turmoil, but a victory also would preserve a sliver of a playoff possibility for them. Of course, ruining a championship run for the hated rival Wolverines would be a welcome byproduct of a win in Columbus. Ohio State has won the past six in the series, which means that in four seasons at Michigan, coach Jim Harbaugh has yet to win the one game he was brought to Ann Arbor to win. As far as how the teams have matched up, this may be his best chance so far. So it’ll be another big one. Ohio State (10-1, 7-1 Big Ten, CFP No. 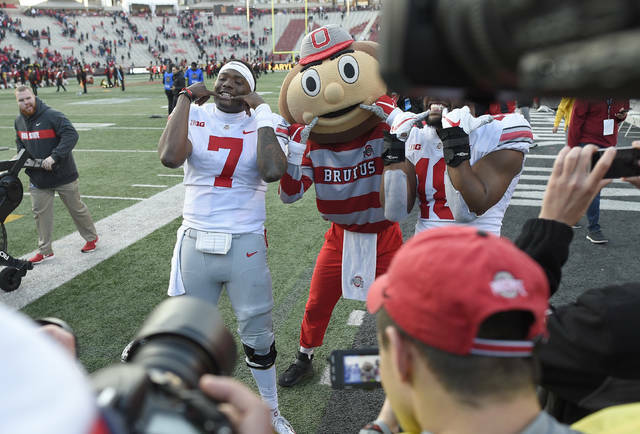 10) scored a lot of points on Saturday, running back J.K. Dobbins — handling the bulk of the carries because of a quad bruise to Mike Weber — piled up a career-high 203 yards and quarterback Dwayne Haskins Jr. broke two more single-season passing records. The Buckeyes will need all that firepower when they face Michigan and the nation’s top defense. But the Ohio State defense has been as flimsy as the offense has been explosive. The unit allowed Maryland to pile up 595 yards of offense, including 298 on the ground by freshman running back Anthony McFarland. Michigan (10-1, 8-0, CFP No. 4) needed a school record six field goals from Jake Moody to get past scrappy Indiana. Star defensive end Chase Winovich left the game midway through the third quarter with an apparent shoulder injury, but Harbaugh said X-rays and CAT scans were negative. There’s no word yet on whether he’ll be available for the Ohio State game. History has shown that records and results from the week before don’t mean much when these two teams clash the Saturday after Thanksgiving, usually in frigid temperatures under gray clouds and with snow swirling in the air.